Byzantine emperor from 395 to 408. He was too weak a ruler to be able to withstand the influence exerted by his court favorites upon his policy toward the Jews. Such privileges as were accorded them were due to his privy counselor, Eutropius (396-399), who easily allowed himself to be bribed into favoring the Jews. (See Pauly-Wissowa, "Realencyclopädie der Class. Alterthumswissensch." s.v.) The laws curtailing the various favors already granted to the Jews are supposed by Grätz ("Gesch. der Juden," 3d ed., iv. 359) to have been promulgated after the death of Eutropius. A law of the year 396 forbids, under penalty of imprisonment, any imperial officer from fixing the price on Jewish merchandise brought to market; the privilege is left to the Jews themselves (Codex Theodosianus, xvi. 8, 10). Still, in this law no reference is had to Jewish market-inspectors, as Grätz infers. It is a matter relating solely to the non-liability of the Jews to the law, De pretio rerum venalium, which was already in existence in the reign of Diocletian. The same spirit of justice manifests itself in another law of Arcadius: "It is sufficiently well known that the sect of the Jews is not limited in its rights by any law" (ib. xvi. 8, 9). In the same year (396), Arcadius issued an edict addressed to Claudianus, the "comes" of the Orient, wherein he is ordered to protect the "illustrious patriarch" against insult (§ 11). He also commanded the prefect of Illyria (in 397) to prevent any ill treatment of the Jews, and to guard their synagogues against any disturbance "of their wonted peaceful condition" (§ 12). Moreover, the Jewish patriarchs, as well as all of their legal functionaries, such as the archisynagogoi and presbyters, were to enjoy the same privileges as the Christian clergy, and be relieved of curial taxes. In the last clause, Arcadius refers to the measures of the emperors, Constantine the Great, Constantius, Valentinian, and Valens; but Gothofredus remarks concerning this law (§ 13) that the privilege was suspended under Valens in 383. In 404 Arcadius again confirmed these privileges to the patriarchs and other officials of the Jewish communities, and once more with reference to his father, the legislator, the emperor Theodosius (§ 14). All of these laws may be found chronologically arranged in the section of the Digest, "De Judæis, Cœlicolis et Samaritanis." 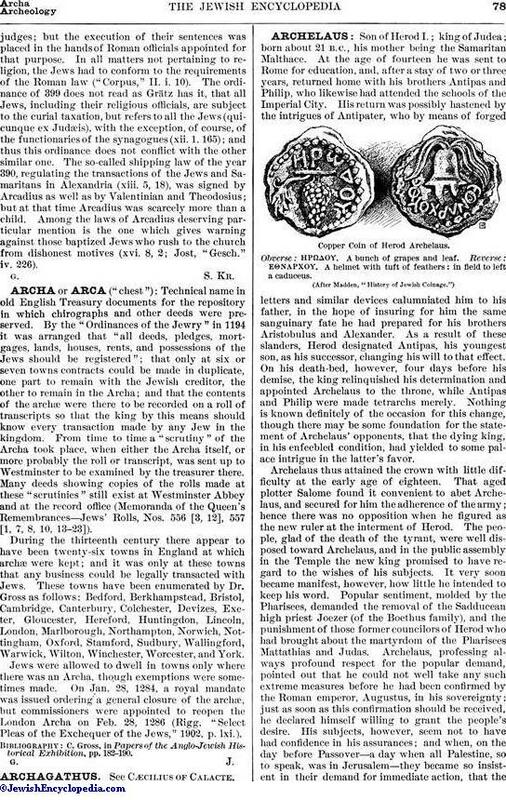 But laws concerning the Jews emanating from Arcadius are also found in other portions of the codex of Theodosius. In February, 398, Arcadius ordered that in all civil contests, if both parties agreed, the Jews might elect their patriarchs or any other officers asjudges; but the execution of their sentences was placed in the hands of Roman officials appointed for that purpose. In all matters not pertaining to religion, the Jews had to conform to the requirements of the Roman law ("Corpus," II. i. 10). The ordinance of 399 does not read as Grätz has it, that all Jews, including their religious officials, are subject to the curial taxation, but refers to all the Jews (quicunque ex Judæis), with the exception, of course, of the functionaries of the synagogues (xii. 1. 165); and thus this ordinance does not conflict with the other similar one. 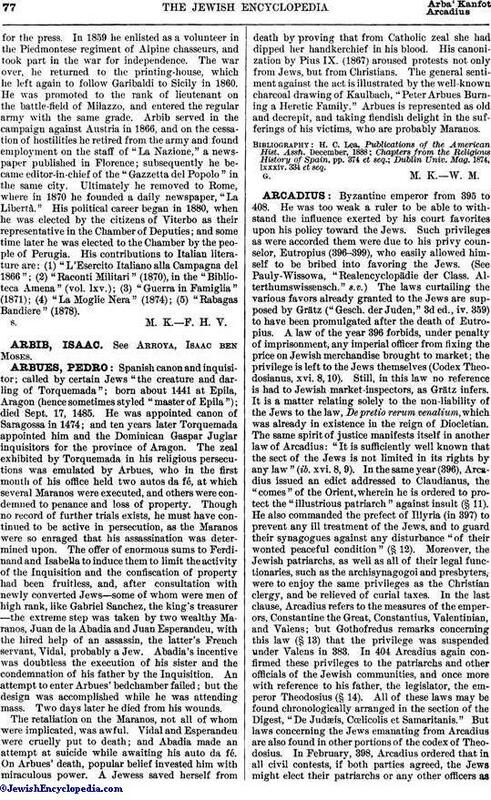 The so-called shipping law of the year 390, regulating the transactions of the Jews and Samaritans in Alexandria (xiii. 5, 18), was signed by Arcadius as well as by Valentinian and Theodosius; but at that time Arcadius was scarcely more than a child. Among the laws of Arcadius deserving particular mention is the one which gives warning against those baptized Jews who rush to the church from dishonest motives (xvi. 8, 2; Jost, "Gesch." iv. 226).